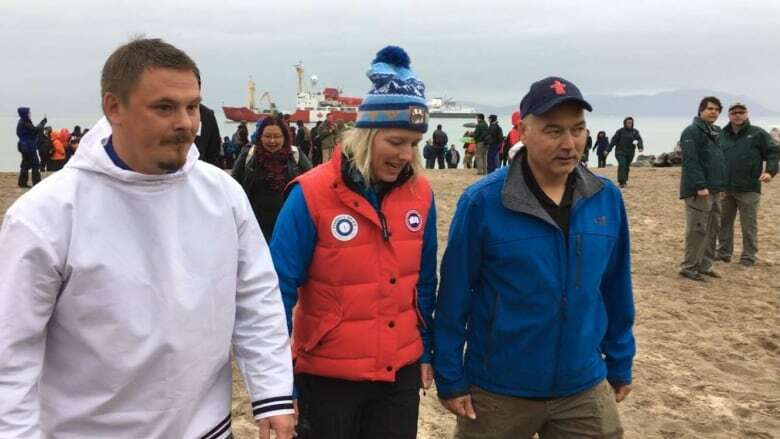 The boundaries of what is now Canada's largest marine conservation area have been announced by Ottawa, the government of Nunavut and the Qikiqtani Inuit Association. Protecting Tallurutiup Imanga, or Lancaster Sound, covers about 110,000 square kilometres of ocean — an area double the size of Nova Scotia — and represents almost two per cent of Canada's coastal marine waters. This more than doubles what was previously protected, but still falls short of the Liberals' campaign promise to protect five per cent of Canada's oceans by 2017. 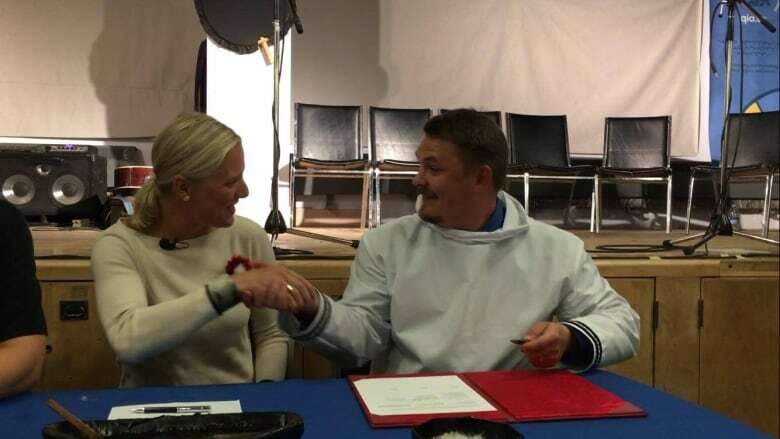 Catherine McKenna, the federal minister of environment, made the announcement Thursday from Pond Inlet, Nunavut, an Arctic community of 1,600, at the edge of the sound. 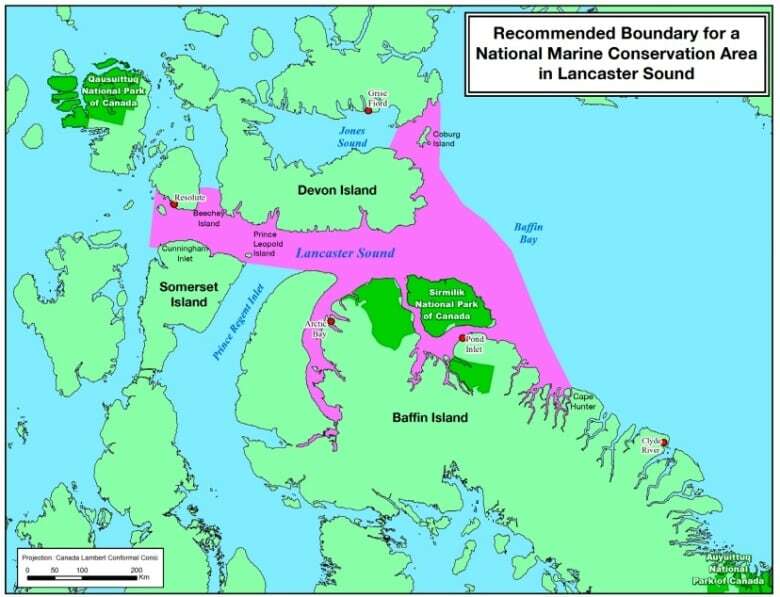 Lancaster Sound is at the eastern entrance of the Northwest Passage, and protecting it has been a work in progress for decades. The area is a vital hunting ground for Inuit, who began advocating for protection in the 1960s. The Conservative government considered protecting the area in 2010, but the Qikiqtani Inuit Association wanted more area encompassed. The new national marine conservation area, together with Sirmilik National Park, Prince Leopold Island Migratory Bird Sanctuary and the Nirjutiqavvik National Wildlife Area, now bring the total protected area in the region to more than 131,000 square kilometres. A national marine conservation area is much like a national park on water. Now that boundaries have been announced, management decisions will be based on Inuit traditional knowledge. Five Inuit communities are within the boundaries of the protection area, and an Inuit Impact Benefit Agreement is expected to be negotiated within 18 months. "Through the establishment of the Inuit Impact and Benefit Agreement, Inuit in this region will continue to benefit from this marine area, and grow and prosper into the future," association president P.J. Akeeagok said in a news release. "It's important that there is benefit to local people because local people can be the best guardians of nature if their needs are met," David Miller, president of WWF-Canada. told CBC. Lisa McLaughlin, vice-president of conservation at the Nature Conservancy of Canada, said that once the Inuit impact agreement is finalized, the conservation area will be formally established. From hereon in, there will be no oil and gas exploration in the region, but other details are still being worked out. Miller said WWF-Canada would like to see some restrictions on shipping. Lancaster Sound is an area rich in biodiversity, encompassing the migratory routes of several species of sea birds and whales, and home to polar bears, seals and walruses. Around 75 per cent of the world's narwhals summer in the sound. and 20 per cent of the world's belugas migrate through. "There's open water up there, which actually creates a small microclimate, which can support a lot of different species," McLaughlin said. "Some of these species, this is where they have their nurseries, this is where they have their calves, it is where they migrate, so protecting this area is really critical. "The size of [the protected area] is so spectacular because it really allows for that kind of movement and protection of those species, so this is a really fantastic conservation outcome for the country, but also globally." Shell Canada contributed to the marine conservation area by voluntarily relinquishing 30 oil and gas exploration leases covering about 8,600 square kilometres of Arctic waters in the area. Trudeau Tracker: Have the Liberals kept their promises to protect our water?